The house of reclusive fantasy author Elena Fitzgerald. Question: I've never been - should I go? Answer: Yes. Question: I went one/two/three years ago - should I go again? Answer: Yes. Delusion is so sui generis that it almost has to be compared to itself and nothing else. 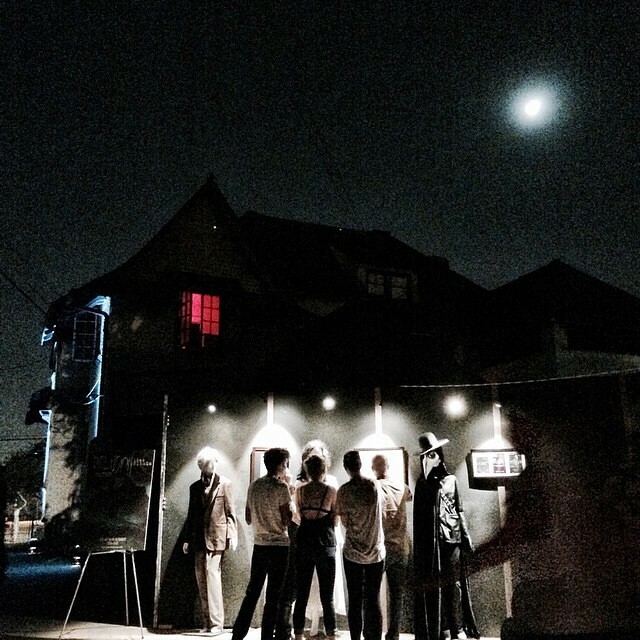 There are dozens of Halloween events in Los Angeles, and many of them are great, but most of them leave one thinking, "I've seen that before - or at least something like it." 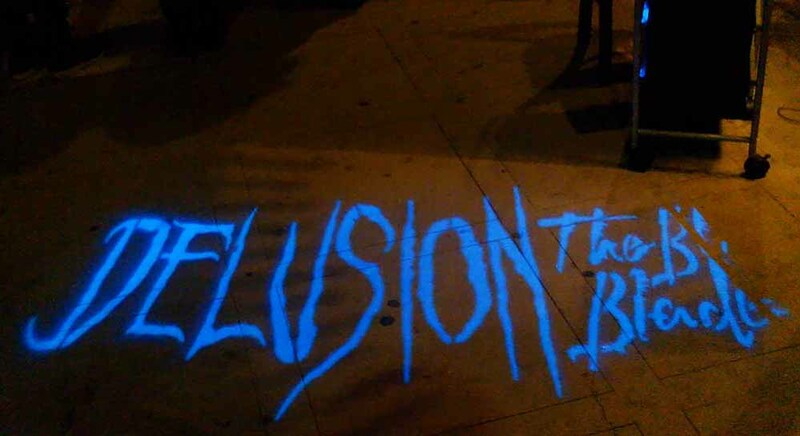 Delusion, on the other hand, offers sights, sounds, and experiences that one will encounter nowhere else, making it a must-see event every October. Having set the bar so high, Delusion makes it harder and harder for each new installment to surpass its predecessors, but even the "worst" Delusion ever (like the "worst" Beethoven symphony) is going to be better than ninety per cent of the competition. The best parts of Delusion Lies Within are such startling surprises that it would be a crime to spoil them for you; consequently, you will have to take our word for their existence. Omitting these details may make the play sound less exciting than it is, but trust us: when you encounter these frights for yourself, you will thank us for our discretion. Now, with that out of the way, let us proceed! The house is old and ominous as you approach - not overtly haunted, but slightly sinister, with the promise of mystery inside. Reclusive dark-fantasy author Elena Fitzgerald is reputed to reside within; you and your fellow fans intended to find her. Your first task is perhaps a bit too easy: moving some boxes to access a small square door leading to a lower room. Inside, you encounter another devoted fan, one who has been lost within the recesses of the house for too long. Strangely, she seems less like a reader swimming in her favorite author's fantasy world than like a junkie awaiting a fix. It's an inexplicable anomaly: this vast mansion supposedly houses Elena's tales made flesh; one would expect a fan lost therein to be more ethereal, as if untethered from reality. Somehow, you survive and rejoin the group. In a living room, you find a clue embodied in a painting - a distorted representation of the room in which you stand, with a phantasmal figure lurking, waiting, screaming... No such figure appears to be in the room - none visible to the eye, at least - but appearances can be - and are - deceiving. Even the most practiced ghost hunter will not anticipate this particular manifestation. If you are lucky - and if you take a dose of a slightly unpleasant "invisibility potion," you may evade the angry glowing spirit. You will find a new guide who will lead you upstairs to a tiny, windowless room where a demented child communicates only through messages written in crayon. His mother arrives and removes some of your comrades, dragging them off for an unseen encounter involving sordid depravity of a sexual nature. Meanwhile, you discover a clue that leads you to literally expand the room, revealing a previously hidden occupant, who may or may not be helpful. If you escape, you will ascend to the attic, where children's playthings, forgotten and dusty, rest among cobwebs - until they come to life, rocked by unseen hands or levitated into the air. As delirium overwhelms you, you may feel as if you have wandered into a demented dream. Run away - down the stairs - before madness dissolves your mind. 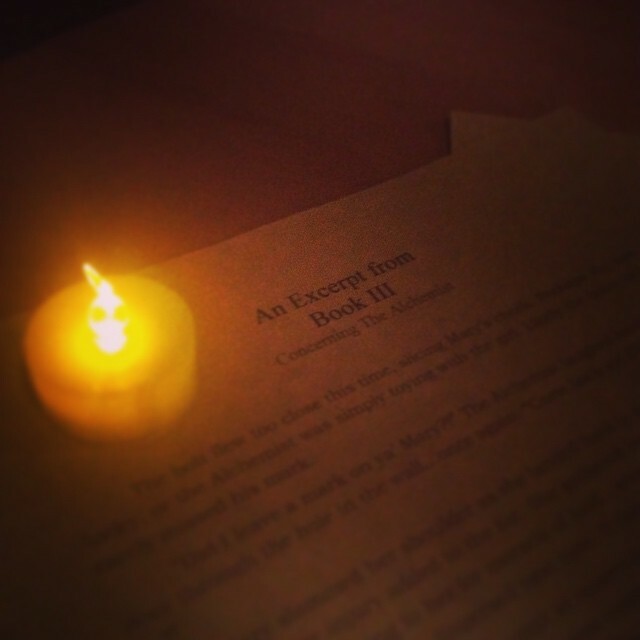 Does a clue to your salvation lie in the pages of Elena's unfinished manuscript? Finally, you will descend into the basement, where all manner of revelations await, including the object of your quest. But will you be able to prevent her latest novel from being completed - and unleashing Hell on Earth? What will the infernal ones do with their minion after she has served her purpose? And is there any hope of escape for you? Delusion Lies Within offers a welcome return to the old-fashioned haunted house ambiance of its first two Halloween seasons. The story is completely different, but the overall template is familiar (the dark room, the climactic descent into the basement, etc). Fortunately, these familiar beats are enlivened with some amazing and novel effects that defy belief. (Had someone told us what was planned, we would confidently have proclaimed, "Impossible!" - and then been forced to eat our words.) There are two that stand out in memory, but we will describe neither except to say that the first happens so early that we feared it would render everything else anti-climactic - and then, exceeding all our expectations, the second exceeded the first. By "effects," we do not mean only technical trickery. We also mean effects of atmosphere and drama - the elements of the play orchestrated to achieve a psychological effect upon the audience. For example, intentional or not, the attic scene recalls the surreal imagery of Italian horror filmmaker Mario Bava at his best - taking the innocent imagery of childhood and transforming it into something unexpectedly sinister. The actual physical effects (making inanimate objects move, while obscured by darkness) are fairly straightforward; the impact on the audience, however, is profound. Like previous installments of the haunted play, Delusion Lies Within achieves what Halloween Horror Nights at Universal Studios Hollywood promises but fails to deliver: you will feel as if you are inside a living horror movie. In fact, this story seems even more cinematic than its predecessors, and one could easily imagine it making the jump to the big screen. As always, we enjoyed the interactive nature of the drama - being locked into a room and gassed, taking the pulse of a comatose person who suddenly springs to life - and would love to take a second journey through Elena's house to experience those aspects we missed (even if, reportedly, they involve bathing a wrinkled old woman). Our only complaints are with the beginning and the ending. In its attempt to build gradually to a climax, Delusion Lies Within takes too long to get started, and the characterization of the fan we meet in the first room seems wrong. For a play that strives to drown its audience in dark fantasies brought to life, this character seems stuck in the real world, anxious and nervous, as if seeking a fix rather than seeking her favorite author. She is not literally supposed to be an addict, but the performance left us thinking of a strung-out junkie and wondering, "Is there anyone more grounded in reality than a person whose gnawing addiction serves as a constant reminder of the body and its physical needs?" We wanted to see someone more spaced-out, as if our presence had called her back to reality from another dimension. The climax also falls short, building to a moment that suggests a Roger Corman horror film, such as The House of Usher - which typically ended with an ancient mansion burning to the ground. That certainly would have been the perfect ending Delusion Lies Within, and though we appreciate the difficulties in crafting this illusion (we don't expect the house to literally burst into flames around us), we would like to think that a garish red light, a little "smoke" (i.e., dry-ice fog), and some cracking sound effects could have given frantic fans the impression of a supernatural fire forcing them to flee from the house. I will take you places where you have never been. I will show you things that you have never seen. Displays from past versions of Delusion adorn a wall near the house. There is a parking lot on the property this year, so you will not need to search for spaces on the street. A bar is in the garage area, selling snacks and beverages. Free canned coconut water (a promotional tie-in, apparently) is available in sweetened and unsweetened versions. As you approach the bar, there is charming display of of relics from past Delusion haunts, including newspaper clippings from creator Jon Braver's earliest amateur efforts. 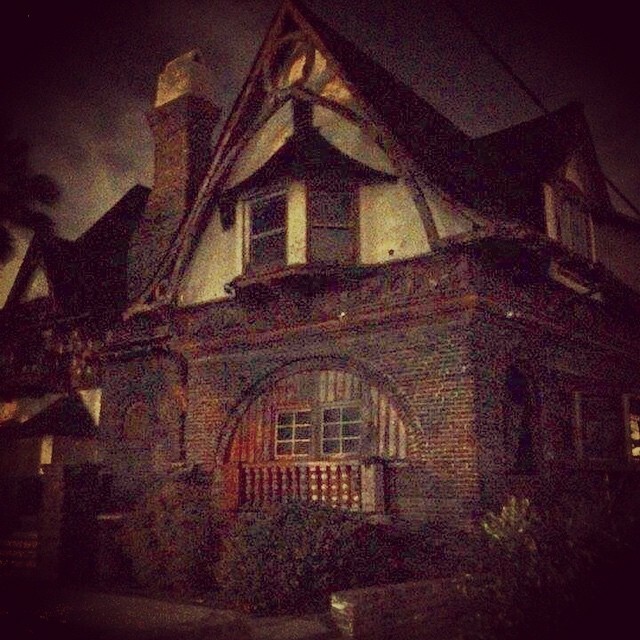 Delusion Lies Within is located at 2525 Arlington Avenue, Los Angeles, CA, 90018. The show runs through November 2 15, but all performances are sold out; more dates may be added. Click here for updates at the official website. Looking for more dramatic horror this Halloween? 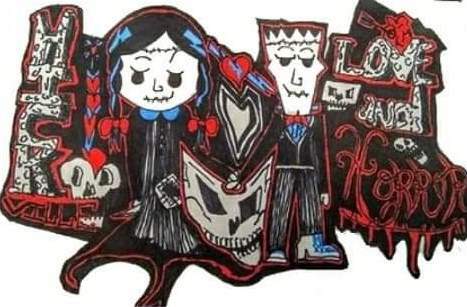 Check out our pages for Halloween Haunts and Halloween Haunts: Tours and Shows!